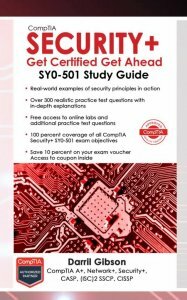 If you’re an instructor or trainer and plan on using the the CompTIA Security+ Get Certified Get Ahead: SY0-501 Study Guide you might be interested in some additional Security+ Instructor Resources. Many instructors in the United States and several other countries are using this study guide to help their students pass the Security+ exam the first time they take it. I have created PowerPoint presentations specifically for these study guides. Note: A recent trend has been for people to ask for these slides as a study aid instead of using the book. I created them specifically to make it easier for instructors to teach from the CompTIA Security+ Get Certified Get Ahead: SY0-501 Study Guide and many instructors are doing so successfully. However, they aren’t an effective study aid.